The town of Sokone, Senegal, has named a street after General (ret.) Lamine Cissé to honor the esteemed Africa Center alumnus. 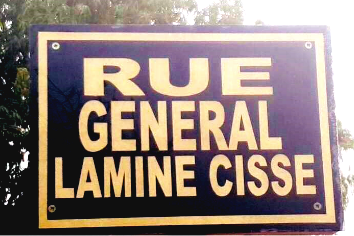 Regarded as one the Senegal’s most admired and dedicated leaders, General Cissé is the President of the Africa Center’s Alumni Chapter in Senegal. “General Cisse is one of the first military leaders to advocate for the concept of human security in Africa, and the entire continent is fortunate to learn every day from his tireless dedication and exemplary leadership,” said Dr. Adjaratou Wakha Aidara Ndiaye, Executive Director of Partners West Africa. Born in 1939 in Sokone, General Cissé is a graduate of École spéciale militaire de Saint-Cyr, France; the U.S. Army Command and General Staff College in Fort Leavenworth, Kansas; l’Institut des hautes études de défense nationale in France; and the National Defense University in Washington, DC, where he was inducted into the Hall of Fame. He has attended more than two dozen Africa Center academic and engagements programs as participant, facilitator, and guest speaker. General Cissé retired from the armed forces in 1997, having served as Chief of Defense Staff with the highest military rank bestowed upon any Senegalese Army officer. In 1998, General Cissé was called out of retirement by President Abdou Diouf to serve as Minister of Interior to organize the general elections which led to Senegal’s first political democratic transition. In 2001, General Cissé began his international civil service assignment as Representative of the UN Secretary-General in Central African Republic and head of the UN Office in Central Africa. In 2007, Secretary-General Ban Ki-moon appointed him Representative of the UN Secretary-General in West Africa. In this capacity, General Cissé presided over the Cameroon/Nigeria commission for the dispute over the Bakassi peninsula.